With a quest to try different rice varieties, Amma got herself a bag of brown Rice. Then she searched for recipes that can be made with Brown Rice. This dish was something she made couple of weeks before and we tried it again. Brown Rice is supposed to be healthier than the white rice and takes longer time to cook. So you really have to plan for it ahead. Plus the fact that digestion of this takes a bit longer time, it should be an ideal rice for diabetes. Cook this in different ways and plan for a variety in menu. Soak Channa dal for 5 hrs or overnight. Soak Brown rice for 2 hours. Heat a pressure cooker with oil, add curry leaves, onions, ginger and garlic, Peppercorns, Ground nuts, Red Chillis. Fry well. Drain the water from Channa dal, add to the pan. Fry well. Then add the drained Brown rice. Mix well. Add 2 & 1/2 cups of water or more if you want it little soft. Pressure cook for 4 -5 whistles. thank you very much.I am waiting for this. as i am diabetic i want these type of receipes.very healthy and yummy. thank you very much. very healthy rice. i am waiting for this. 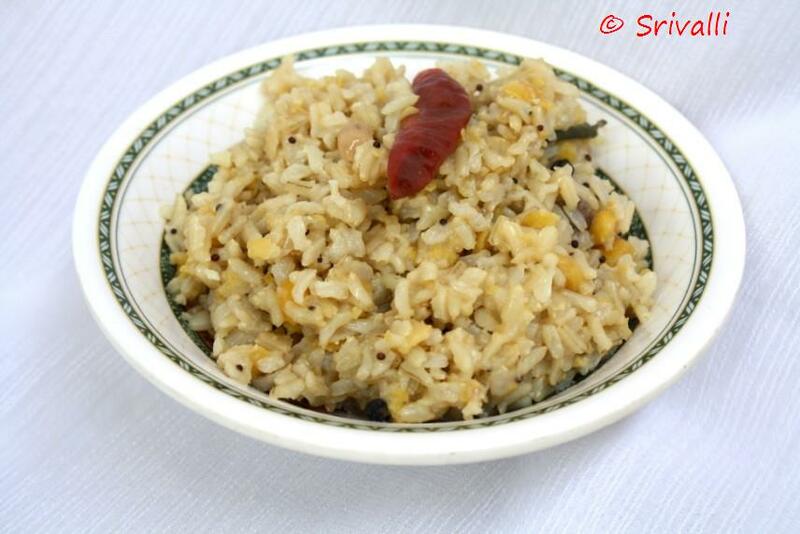 I love the nutty flavor of brown rice..I am sure it would taste yummy with channa Dal! !